I have a special affinity for Hephestus, Blacksmith of the Gods. You see, in Roman mythology, his name was Vulcan. LONG before a pointy eared alien played by Leonard Nimoy OR Zachary Quinto, Vulcan was a cool dude. Although he was a gruff, unattractive, deformed god, he still got to hook up with Aphrodite as husband and wife! THAT’S RIGHT! The goddess of beauty and the god of the forge. And while Aphrodite did cheat on poor Hephestus with Ares, Festus got the last laugh when he set a trap for the lovers in a net and dragged them both, naked, to be judged to Mount Olympus in front of all the other gods. Although the Greeks viewed the God of Volcanos him as grotesque due to his bum leg, Hephestus made the cool stuff that the gods used such as armor, weapons, and girdles all imbued with magical abilities. 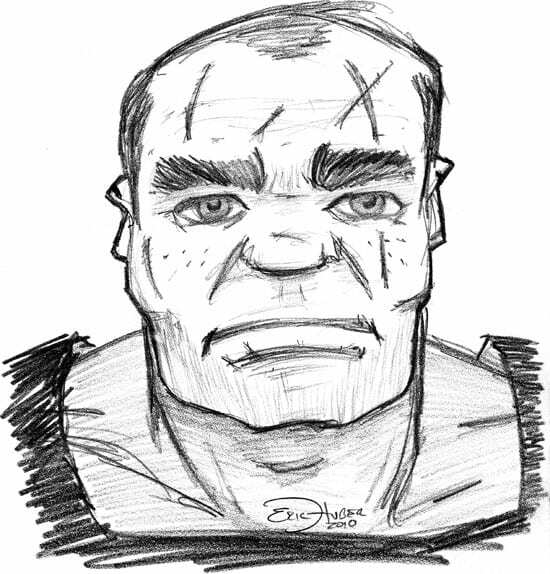 I drew Hephestus as a scarred up, muscular, rough-looking dude with a balding head and short facial hair. Afterall, working with all that fire, it seems like you’d want the least amount of stuff to burn as possible.